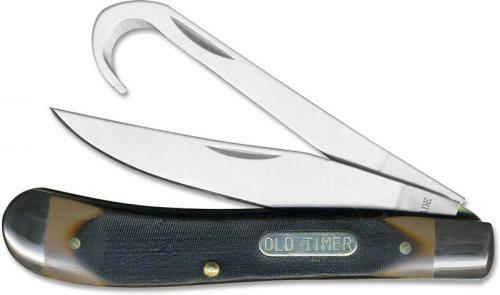 The above illustrated Old Timer Horse Pick knife features a 3 1/8" clip point blade and a 3 1/8" horse pick tool. The sawcut delrin handle, 3 3/4", features brass liner, Old Timer shield and nickel silver bolsters. The horse pick tool is used for cleaning the underside of a horse's hoof by removing any mud or debris that may have gathered. This pick, however, more closesly resembles a gut-hook and is sharpened. Knives are just like I wanted Knives Plus shipped my knives out fast. I have been recommending Knives Plus since my first order. The Old Timer Horse Pick, SC-SOTHP knife is mt favorite great for small game and feild dressing large game ..I love this knife I will order more as gifts next year.